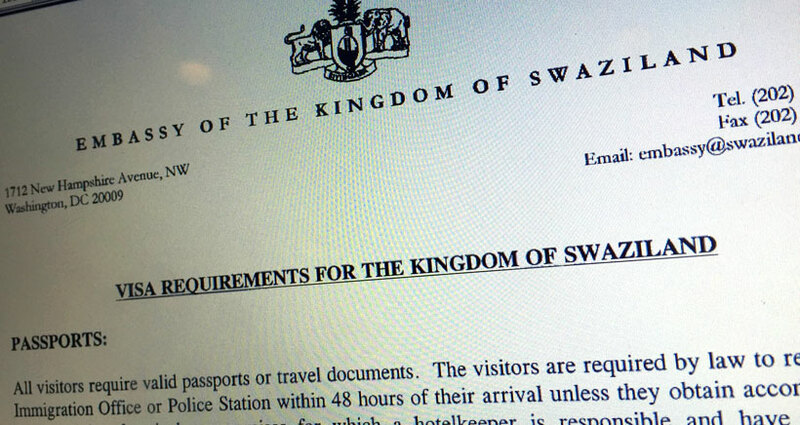 If you are visiting the Kingdom of Swaziland, which borders Mozambique and South Africa, and if you are required to apply for a tourist visa, then there are limited resources online that give you information on how to apply, where to apply, visa fees, and application forms. After going through the government website or their tourist website, we could not find specific and concrete details on how to apply for a tourist visa and other details. So after calling the Embassy of Swaziland in Washington D.C. multiple times with no response, we were finally able to get hold of someone and upon request, they sent the visa application form with all the requirements. Important note: The following details are from the Embassy of Swaziland in Washington D.C., and may be applicable to residents in U.S. only that require a visa to visit Swaziland. Requirements and fees for applying from your country may be different, so please check with the local embassy for details. This application form has all the requirements mentioned. Although the requirements may be applicable for U.S. residents, the application form itself seems to be common for all applicants worldwide. Send your feedback and questions in comments below.